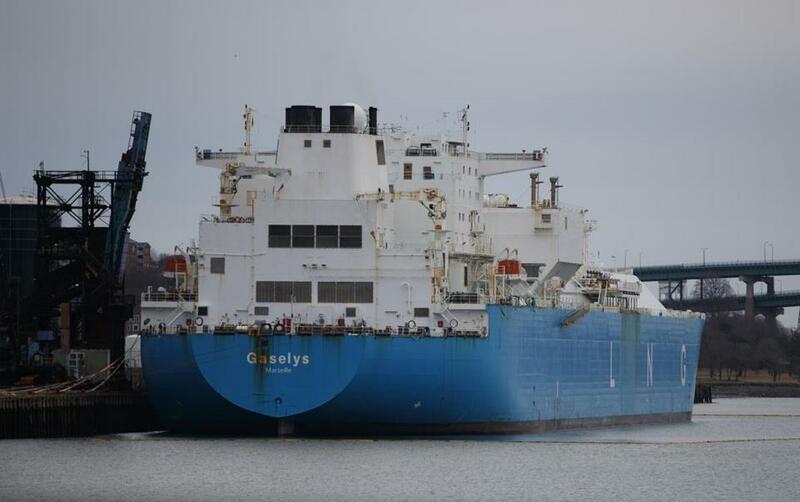 The LNG tanker Gaselys docked in Everett on January 28. If trains carrying liquid natural gas start chugging through Massachusetts, spewing needless extra greenhouse gas emissions, the excuses from Beacon Hill probably won’t be far behind. But state officials’ decisions opened the door for the industry’s quiet push to ship gas by rail into New England. And if those methane trains start rumbling through the state’s downtowns and past constituents’ backyards, voters will know just who should be held accountable. In 2016, Attorney General Maura Healey and the state Senate blocked plans to expand natural gas pipeline capacity in Massachusetts, leaving the state reliant on liquefied natural gas instead. Imports have traditionally come from overseas by ship. But the high natural gas prices caused by pipeline constraints make for a tantalizing business opportunity, and last year a rail trade group filed a little-noticed request to haul natural gas from Pennsylvania to New England. The regulatory agency, the Pipeline and Hazardous Materials Safety Administration, said the petition was pending. At first glance, the prospect of gas-by-rail would seem like just another way the faddish anti-pipeline politics on Beacon Hill continue to backfire. The resulting capacity shortfalls during the winter forced power plants to switch to dirtier coal and oil, driving up greenhouse gas emissions, and caused the state to rely on gas imports from a sanctioned Russian gas company linked to one of Vladimir Putin’s closest cronies (a second ship carrying Russian gas docked Thursday in Everett). Keeping out pipelines has also meant that even new power plants in Massachusetts are planning to build higher-emitting oil generators as winter backup. With the arrival of an LNG tanker on Sunday, New England’s odd energy politics grew even stranger. abstinence-only ideology the pipeline vote embodied. Some kinds of fossil fuels burn cleaner than others, and some ways of transporting them do less damage. Using incentives and the limited powers of state government to steer industry toward less harmful outcomes should be a priority. But a contingent of lawmakers, including state senators Marc Pacheco and Jamie Eldridge, have taken the position that the state should instead abstain entirely from fossil fuel infrastructure while awaiting its clean energy future. Abstention has an undeniable moral appeal. And renewable energy is certainly the region’s future. The problem, as the possibility of gas-by-rail shows, is that those dirty decisions about which fossil fuels to use and how to transport them are still being made every day by shippers, producers, federal officials, and consumers — many of whom may have no interest in the state’s carbon-reduction goals. The state still burns way too much oil and gas for elected officials to just sit on the sidelines while companies buy Russian gas, burn oil in the winter, and draw up plans for gas by rail. Shipping hazardous materials by rail often raises safety concerns — understandably, considering the history of rail accidents like the Lac Megantic oil train crash, in 2013, that killed 47 people in Quebec. But the invisible toll is troubling, too. Train locomotives, once called “smokestacks on rails” by an environmental group, generate greenhouse gas emissions. Railroads say their locomotives are cleaner now, but a 2017 study of crude-by-rail, which skyrocketed in the early 2010s, found that it generated emissions almost twice that of pipeline shipping. And unlike crude, natural gas needs to be cooled into liquid form by the shipper to create LNG and then vaporized back into natural gas at the receiving end, energy-intensive steps that worsen its carbon footprint and are unnecessary for pipeline gas. Still, if the federal government approves gas-by-rail, the state may have little recourse. Congress purposely made it difficult for states to regulate railroads. Those federal preemption powers provide a ready-made excuse for state lawmakers to deflect blame. But they put out the welcome mat for LNG, and the fact that Beacon Hill isn’t omnipotent only underscores why the Legislature needs to make more pragmatic use of the powers that it does have. Massachusetts needs more clean energy. It also needs to limit the damage from its fossil fuel use, through investments that should include pipelines to finish the work of displacing dirtier fossil fuel sources like oil, coal, and imported LNG. And it needs to reject rhetoric that pits encouraging renewables and reducing fossil fuel-related emissions against each other, as if the Commonwealth can’t pursue both. The counterproductive results of the state’s experiment with moral purity are becoming painfully clear. It shouldn’t take a gas train rolling through town to convince legislators that they’re steering the state onto the wrong track.